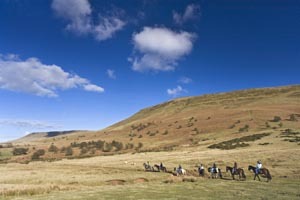 Horse Riding Holidays with self catering bunkhouse accommodation..
Why not stay in our self-catering accommodation at our Cadarn Bunkhouse where the horse riding is based. Step out the door and the horses and ponies will be waiting for you in the yard ready for riding. We have a small self-contained unit comprising of 3 rooms each sleeping 3 people. This has its own kitchen and dining area, shower room and lounge. It also has an outside decking area and enjoys stunning views of the Black Mountains and the Wye Valley, and of course our riding horses and ponies grazing in the surrounding fields. Our local pub, the Three Horse Shoes in Felindre is close by and serves excellent pub food with a warm welcome. 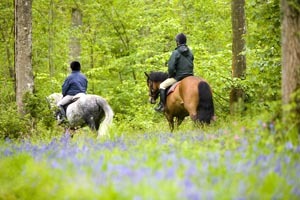 The costs below are a guide as we can tailor the riding and accommodation package to suit you. Please call 01497 847351 or e-mail info@tregoydriding.co.uk to discuss your holiday requirements.